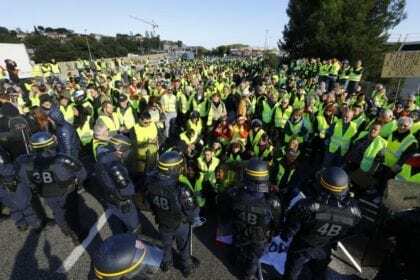 A new series of demonstrations have erupted in France: the “gilet jaunes [yellow vests]”. This movement started in 2018, from an online petition which had grown 300 000 signatures large by October. From there, massive street demonstrations have followed, with some violent eruptions, particularly in France (but in other regions of the world too). The causes for discontent have been mainly economic, related to taxes on fuels, income taxes, minimum wage and the monopoly of large retailers in villages and cities (which end up asphyxiating small businesses). However, the list of claims grows larger, including demands like eliminating homelessness, financial incentives for home insulation, protecting national industry (in France) and a cap on salaries (at 15000 Euro/month). It even includes the controversial claim that the production of hydrogen vehicles should be incentivized, instead of electrical ones (even though hydrogen for vehicles is produced using electricity). The basic income movement in France (MFRB – Movement Français pour un Revenue de Base) has written on the “yellow vests” phenomena. In this article, it is suggested that demands from the “yellow vests” movement are aligned with the basic income idea. However, the list of demands above mentioned do not refer basic income, and do not question the conditionality of the present system of benefits and taxation. These do contain the immediate call for taking people off the streets (ending homelessness), but no further ideas on how to do it. On the other hand, these social events and demonstrations have spurred discussion and public appearances voicing the basic income concept. Public figure and philosopher Abdennour Bidar, has defended basic income as a way to “stop strangling citizens with economic constraints”, on France TV (C La Suite). Cyril Dion, a known French filmmaker and environmental activist, has also supported basic income, alongside Bidar, as a way to both reduce acute inequalities and bring forward true environmental protection. According to him, there can be no ecology without social justice, which is also the opinion of other French thinkers and activists, such as Guy Valette. Also, on the political ground, Benoît Hamon (individually and under his recently formed Génération.s. party) has been defending the basic income policy in France, ever since the beginning of the last presidential elections. What does France do with their jobless poor?